Narita Airport. Ceramic artist Kondo Takahiro got off the jumbo jet from New York at about 4:00 in the afternoon on March 22 and headed straight into Tokyo; about an hour train ride from the terminal. What a week it was for this talented Kyoto-based potter. A successful opening in New York at the Barry Friedman Gallery and an exhibition traveling to three locales in Japan -- talk about trying to be two places at once! The first day of the Tokyo exhibition was the same day his plane touched down at Narita, not a minute to spare. 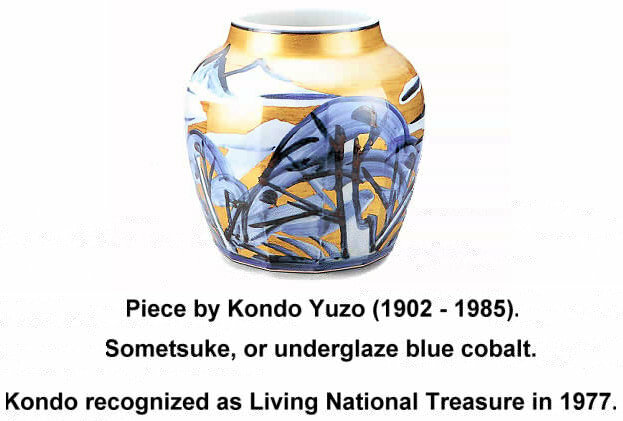 Kondo grew up with pottery - his father and his grandfather had successful careers, especially his deceased grandpa, Kondo Yuzo, who was named a Living National Treasure in 1977 for sometsuke or underglaze cobalt-blue wares. Kondo told me that always being asked about and compared to his grandfather was mendokusai or troublesome. I imagine it would be so when one wants to establish a unique identity, but the fact of the matter is there's no way to escape it - especially in brand-loyal Japan. He seems to have reluctantly accepted it and is moving forward with his own voice. Like so many department-store galleries, the rooms are stiff and very much without ambience. 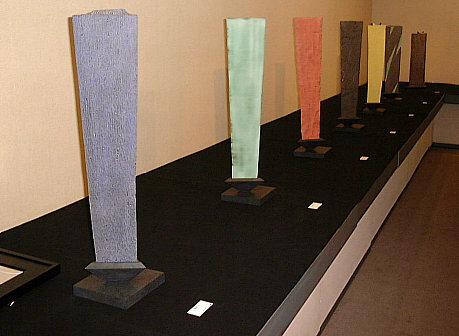 Kondo did his best to change that with tall display stands and hanging wall pieces. 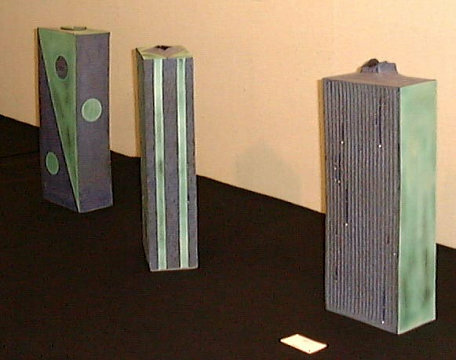 As one entered the gallery, six tall stands were on the left, and on each was a small koro (incense burner) or a small toubako (ceramic box). Each had a little red sticker on its placard signifying a reserved piece. 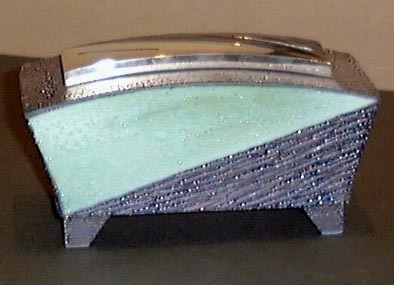 One koro had a diagonal line separating areas of green and blue - on top was a silver lid especially made for the piece. Like some other pieces in the exhibition, I didn't care that much for this color combination - Kondo was playing with all kinds of colors on other pieces - oranges, yellows, browns, and greens. Yet, true with his roots, it was the blues that worked most successfully on most of the work. 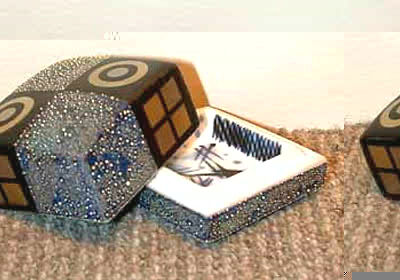 A small koro similar to one shown in NYC was the best of these fragrance dispensers. 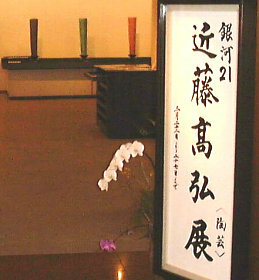 In another move to differentiate his work from his predecessors he's taken away the term koro and calls his work kouki - the first kanji meaning fragrance and the second talking of feeling. Kondo's heart and feeling are in the right place, yet he has to refine them a bit more, which I'm sure he'll do in time. When one comes from such roots and has a unique vision, it requires experience to balance technique and intuition to refine them to the point of maturity. That point could be seen in some of Kondo's less refined works where he seemed to be trying too hard. 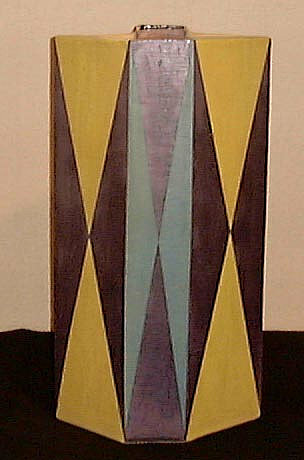 Circus-like diamond color schemes just didn't cut it on some tall, angled forms. 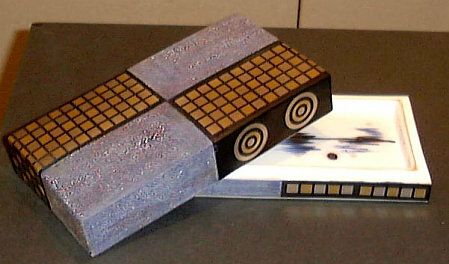 They lacked the refinement of the smaller works and were too design-oriented. 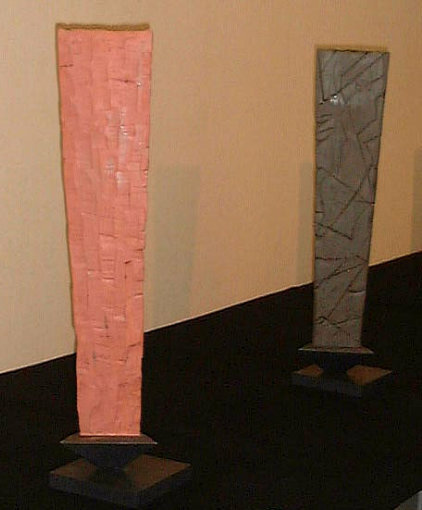 His color tones worked a bit better on the monotone monolith structures that stood in a row in the back of the room. They balanced each other well and I bet will look lonely standing as only one - I think he should have sold them in pairs. 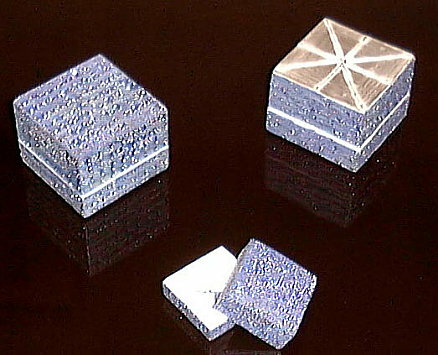 He also had some small round incense cases called kogo that were quite nice (below photo). The future looks bright for Kondo, from Kyoto to Tokyo, from Beijing (exhibited there) to New York. His splendid pots, when they do work, glisten like rain pointing to a refreshing horizon - the one he left behind when his feet touched the ground at Narita. 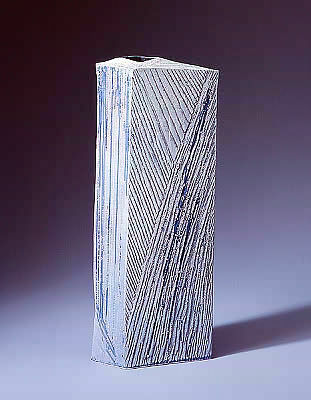 Kondo Takahiro often works with the color blue. He's following in the footsteps of his Living National Treasure (LNT) grandfather Kondo Yuzo who was named a LNT for his work in sometsuke or cobalt blue. Yet the younger Kondo is far from just imitating grandpa, he's created his own technique that has the works coming out of the kiln looking wet! 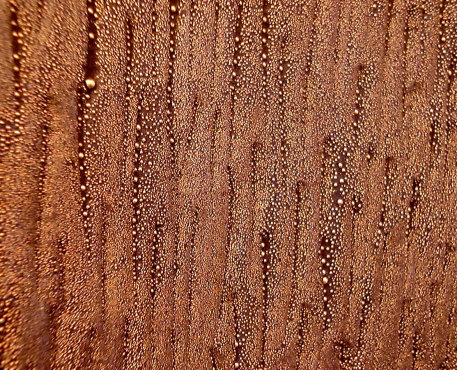 The "rain frozen through fire" effect is droplets of pure silver that Kondo applies before firing. 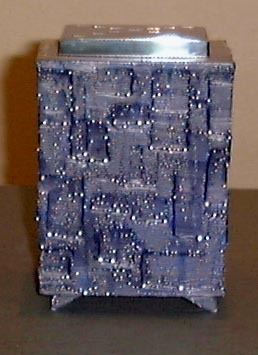 A few pieces he recently exhibited in New York City (see below photos) had a deep indigo blue color with these silver beads studded on the surface - quite spectacular stuff. 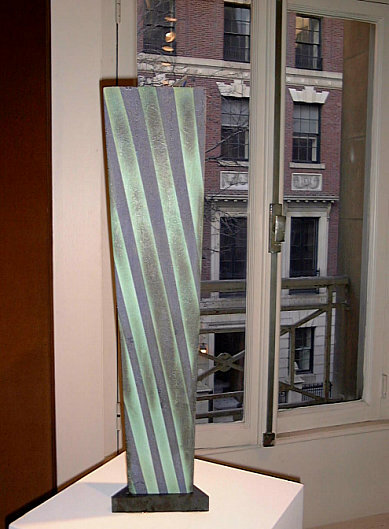 Other Kondo pieces at the NYC Exhibit included larger slender forms with stripes. 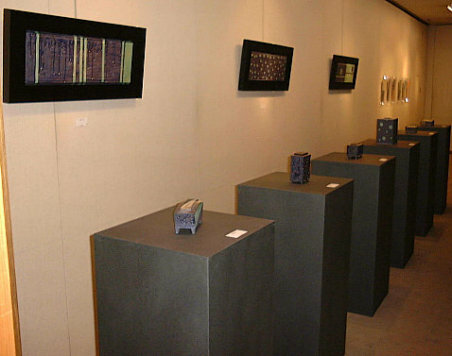 of his work at Yufuku Gallery in Tokyo. Click here for details & photos.